When it comes to packing for Rajasthan, don’t forget to pack your brightest clothes. I was so excited at the thought of dressing up in the brightest of colours that I had rummaged through most of the markets in New Delhi to find the most vibrant of colours. If you don’t feel like venturing out, you can always make use of online shopping coupons to shop from the comfort of your home. 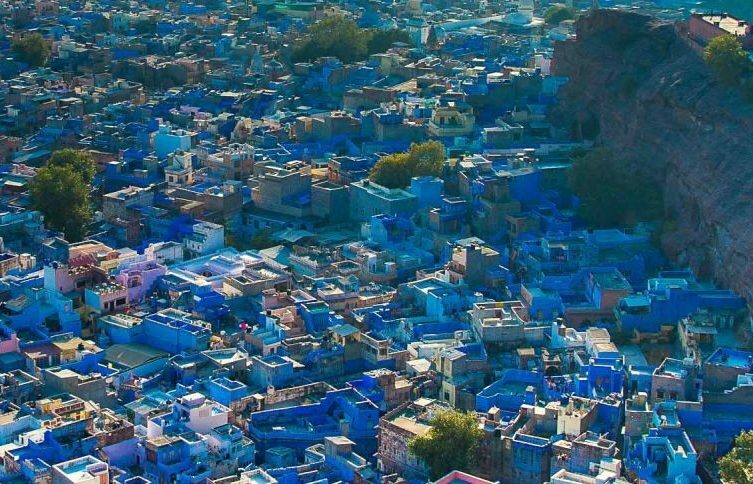 The state of Rajasthan is literally saturated with colour. Rajasthani women love rich fabrics, eye-searingly bright colours, and heavy ornaments. The global wanderer in me loves exploring the fine linkages between textiles and cultural heritage (remember this post?) and there’s nothing I love more than colour. No wonder, I went a bit overboard and packed some of the most colourful clothes in my wardrobe for my city break in Jodhpur. This Lookbook is purely meant to provide some inspiration – pack your most colourful clothes, gypsy trinkets, bodystamps and bindis. Of course, you can tone it down or take it a step further – the choice is entirely yours. I love maxi dresses. They’re perfect for conservative countries and ruddy comfortable. It got really hot during the day, so I just plaited my hair with a colourful Rajasthani tie & dye dupatta (scarf) to keep it out of the way. I layered a couple of bohemian silver necklaces to complete the outfit. The long necklace is vintage – it’s actually made from really old Indian coins strung together on a heavy chain – le perfect! Same crop top, similar skirt and similar scarf. Can you tell I was taken in by Rajasthani costumes? I picked up the gold-coloured head chain from a local market in Rajasthan and just had to wear it with this outfit. Churidars (Skinny cotton pants) are usually worn with long tunics in India but I love wearing them with shirts and tees. It’s the perfect way to incorporate local accents without letting the entire outfit get too costume-y. A white shirt didn’t quite go with the theme of this trip (err colour?! ), so I threw on a bright purple waistcoat on top. How did you do your hair in the first picture? I always think I want to wear neutrals all the time but your blog makes me appreciate my colorful wardrobe. Thank you. Great photos. My favorite is the outfit number 4! Perfect travel look…love the waistcoat. Oh you have presented the Rajasthani look in such beautiful look in different attires. I am from Rajasthan ut never thought Rajasthani touch could be so beautiful. 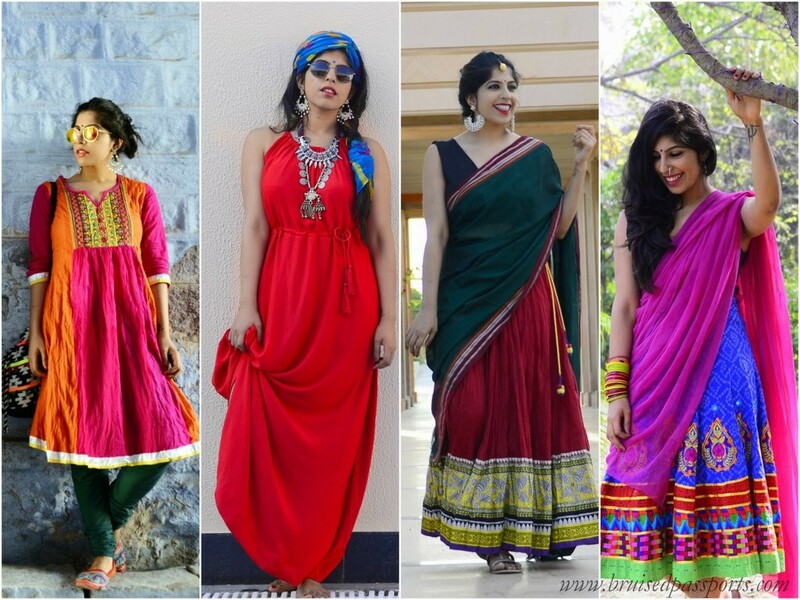 Loved all the outfits – especially the way you styled the maxi skirt and crop top. It looks similar to what we call down south a half-saree :). You look stunning in the pics. I love how the outfits of people in Rajasthan are always bursting with colors. Walking down the streets there is a lively experience in itself. Plus the people here are very courteous and friendly. Nice combo…..jus went through …..instagarm ….fb ….n this toooo……totally inspiring …..n full enthu u n ur blog …. I travelled to rajasthan last month Udaipur and Jaipur. It was really awesome experience. People of Rajasthan actually respect the tourists and are very helpful. State of Rich colours with Rich History. Monuments at Rajasthan are really amazing. Hi Rahul, we are so glad to hear that you had a great time in Rajasthan. Yes it is one of the most colorful states of India and has a lot of architectural and natural beauty.The people are warm and hospitable too and that adds to the charm of travelling there. Rajasthan is the place where the heritage talks everything. Food, dress design, lifestyle everything has an aroma of earth and your dresses are just like that, elegant, beautiful but the tradition of Rajasthan. I bought several dresses like lehenga, kurti, ornament from Udaipur local market. I love Rajasthan the place, the tradition, food everything.